I started some seeds indoors about a week ago and this year I decided to do it right. Usually I rely on natural daylight for growing my plant starts, but with limited daylight and strength, the plants either get leggy or do poorly. I didn't want to invest in grow lights, but then I realized that we have the exact same kind of lights in the "shop" area in our basement. The area near the oil furnace that actually stays quit warm and that I don't ever think about because it's, well, near the oil furnace. And I don't do shop. I replaced the fluorescent lights with new ones and rigged up some racks to elevate the plants near the lights. But, I wanted something that was moveable to adjust the height as the plants grow. 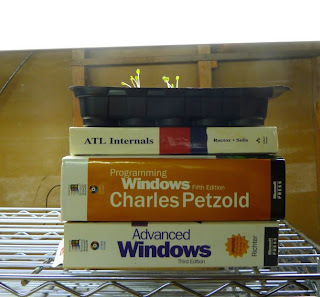 And then I realized the perfect use for all those old technical books that are super thick and don't get used anymore. Et voilà! My new grow operation went live this morning. I'm just getting started so they'll be a lot more plants set up down there soon. I can't tell you how excited I am! 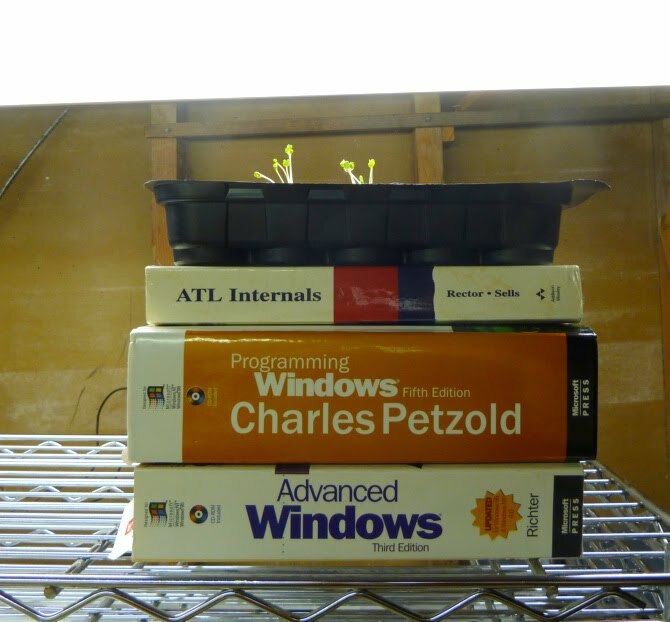 Are you starting seeds indoors this year? Or do you buy plant starts or just direct seed? That's funny! We just use twine to hang the lights lower. LOL Don't the books get all soggy like when you mist your little dears? I'm debating whether to get a blue fluorescent tube lamp or a blue LED bulb to help my herb seedlings along, since I am currently living in an apartment with only one large north-facing window, which means no direct sunlight. Evidently the wavelength of blue light is more conducive to vegetative growth. Both types consume little power and don't waste heat energy. I'll let you know how it goes. Four trays of seeds going so far, and one or two more to come. My cat doesn't like all of the trays on "her" heated bathroom floor. I started my marigold (from saved seed), petunia, and black grape tomatoes(from saved seed). This is my first time doing this and I have no ieda what I'm doing. Like I think I watered to much and caused one of the marigold seeding to fall over at the root line. I have them in my southish window that gets 6-8 hours of sun and over the heat vent. I'm using one of those seed starter greenhouse kits. Can someone tell me what leggy means? Although it's about 2 weeks early I've already planted some peppers, tomatoes, eggplants, and tomatillos. I use alternating hot and cold florescent tubes to start seeds too. @Mimi - "leggy" means the plants get long and lanky, not strong and stocky like you want them. We'll do the usual peppers and tomatoes, but not for awhile yet. I've got thyme and oregano going strong, and still have to do parsley. Then there will be eggplants, cabbage, and a few squash. We do all our starting in the south-facing window and it works decently enough. Someday, though, I'll have a proper setup! You know, I start every year with great expectations of starting my tomatoes and such from seed and every year another disappointment. I have great luck with cherry tomatoes- of course I plant those right in the containers they are going to live in. So for me I will seed start what I know grows for me, and since there is only me buy tomato starts. It's easier, cheaper and much less stressful! I have lettuce, parsley and oregano under the grow lights, with spinach, more parsley and mesclun still on the rope lights for bottom heat, waiting to germinate. Cabbage kale and broccoli will come next, followed by peppers, then tomatoes. Various flower seeds will also be started inside. I usually do. This is the first year in as long as I can remember that I haven't. Generally, I have trays and trays of stuff that I start, then when I put it all in the ground it all dies, and I end up re seeding in the ground or going to the greenhouse to buy plants anyway. I am strapped for cash this year, so I am cutting out the first step. It will be at least mothers day before I can plant outdoors anyway. We have four trays of soil blocks on a heat mat and under a three-fixture grow light that we made using fluorescent fixtures from the home improvement store. For the first time, we're getting results, which is good, because the woman I love had pretty much given up on starting seeds. Starting seeds is one of my new things this year. Before this I have grown a bit but either direct sown or bought a few plants. I am so excited. I have babies! Spinach, lettuce, red cabbage, amchoi all sprouting away. They are under cover outside (it's temperate enough where I am). It's hard to water them right. I am going to look for a mister at the cheap hardware shop. I've been using a couple plant/aquarium bulbs in desk lamps pointed onto my seeds for about 12 hours during the dark hours. It's a success so far!